Rahim al Haj is a composer and Oud player based in Albuquerque, New Mexico. 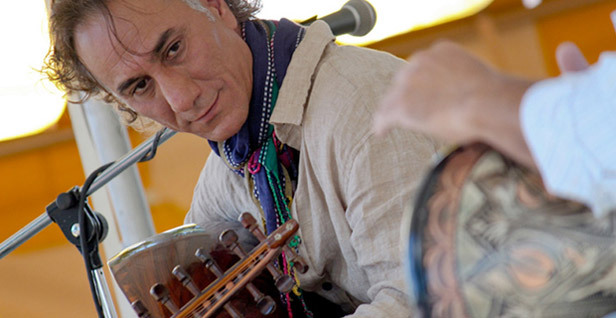 Born and raised in Baghdad, he studied at the Institute of Music under Munir Bashir, and toured the world as part of the Baghdad Ensemble before fleeing Iraq in 1991. He speaks to RUYA about his early career as a musician and how he fuses the Oud with other musical traditions. Rahim al Haj. Image courtesy of the artist. You grew up in Baghdad, before moving to Jordan, Syria and finally the United States. Was it easy being a musician in Iraq? The 80s were not an easy time in Iraq – let alone for artists and musicians – but I had a successful career until I fled in 1991. I studied music at the Conservatorium in Baghdad, under Munir Bashir and I was part of a group known as the Baghdad Ensemble. We played concerts all over the world. But when I got into trouble with the regime, I fled to Jordan, where I lived under a different name and identity. I had to start my career again from scratch. What made you become a musician? I’ve been a musician almost all my life. I started playing at school, when I was 8 or 9. I remember the day my Arabic teacher brought his Oud into class, and I got to play with it. I couldn’t sleep that night because I was so happy, you know, uplifted. He started giving me lessons. He was not a professional Oud player, but he saw something in me, and wanted to teach me. Eventually, he gave me his Oud. When I got into trouble with the regime, I fled to Jordan under a different identity. I started my career again from scratch. Do you still have it? No, It was confiscated on the border of Iraq and Jordan. It was one of the saddest moments of my life. At the time you could not take instruments or books outside of the country. Musicians need an official invitation for performances outside of Iraq, and the Ministry of Culture would draft a letter allowing you to take instruments with you. Because I was fleeing Iraq with false papers, and under a false name, I couldn’t tell them who I was or what I did, and they took the Oud away. Were you able to continue practicing in Jordan? Yes, but under a different name. I remained in Jordan for about 18 months, but I was not comfortable there. The country was too close with Iraq, and there were many Iraqi officials operating in Amman. If you could recreate a sound from your childhood what would it be? During the invasion and before the first Gulf War, I wrote a song called Why? critiquing the situation in Iraq. “Why are there poor people? Why are there rich people?” were some of the lyrics; the authorities couldn’t arrest you for singing them, because they were not directly targeting the regime. I sang it once and then it was passed on through friends. It became really famous, and no one knew who had composed it. A friend sent me a tape recording of the song when I was in Syria a few years later. I laughed. Before the first Gulf War, I wrote a song called Why? critiquing the situation in Iraq. The authorities couldn’t arrest you for singing it, because it did not directly target the regime. It became really famous, and no one knew who had composed it. When did you resume your old identity, and become Rahim al Haj again? It wasn’t until I moved to Syria, which had no diplomatic ties with Iraq, that I felt safe again. I was invited by the communist party of Iraq, who were operating at the time in Northern Iraq, Iran and Syria. I got my name back and started doing concerts in Lebanon and Jordan. What was the first musical piece that you composed? It was a piece that I composed for a youth competition when I was thirteen, and I won an award for it. It was based on an Iranian maqam, known as the Maqam Dasht. It is very famous in Iraq. My piece brought together the traditions of the North and South – to bring together an image of Iraq from the North and the South. What is special about the Oud? All string instruments came from the Oud, like the lute, the guitar, the sitar, the banjo… They call it the “grandfather” of instruments. It is an ancient instrument that dates back to the Sumerian times. It is the main instrument in the Arab world and Middle East – much like the piano is in the West. You have composed music for the Oud and the string quartet, and other instruments like the Didgeridoo. What made you start experimenting with the Oud? When I came to the States I started my career again for the fourth time. I realised people were not familiar with the Oud. It was a weird instrument that they couldn’t pronounce, nor did they know what it looked like. I wanted to make it more familiar so I paired it with other instruments, and composed music for the Oud and a string quartet. In America, I wanted to make the Oud more familiar to audiences so I paired it with other instruments. My next challenge was to compose music for six different continents. Is it an easy instrument to experiment with? With the string quartet it was easy because in Iraq we studied a lot of classical music. The challenge was to maintain the foundations of both musical schools. I didn’t want my Oud to be played like a Western instrument, nor for the string quartet to just be playing Arabic music. What about playing the Oud with the Didgeridoo? My next challenge after the string quartet was to compose music for six different continents. I took the most significant instrument for each country I was exploring: the Didgeridoo from Australia, the Sitar from India, the Pipa – or Chinese Lute – from China, the guitar quarter from Argentina, Rock and Roll and Native American instruments from the USA. The CD set is called Little Earth. Do you go back to Iraq? The first time I went was after the invasion in 2004 – I went to see my family, my mother, my friends, whom I had not seen since 1991. My family had stayed in Iraq, and I couldn’t go back at the time because of the regime. What is your upcoming project? It is a project on the Arab Spring, which I am composing for Oud and Orchestra, using the most traditional instruments from Tunisia, Egypt, Syria and Iraq. From Syria it was the Kanun, and Egypt the Nay. The four movements are already finished, and several orchestras have already agreed to play it.